This is prophetic word for May 2017. Sundown of April 25th marked the beginning of the month Iyar on the Hebrew calendar. This is the second month of the year following Nissan, when the Israelites went out of Egypt and crossed the Red Sea (Passover), and before the Hebrew month of Sivan, when they entered into the promise land. 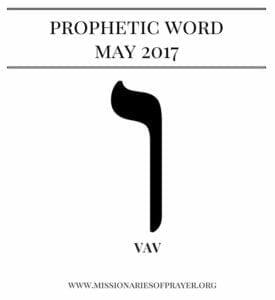 The Hebrew letter associated with this month is the vav. This is a like a connecting pin that connects the cars of a train together. You are connecting Nissan to Sivan with the month of Iyar. You are connecting your past with where you are heading in your future. This is a month of transition. You got out but you have not yet entered in. The month is critical because the decisions you make this month determines whether or not you enter in successfully. Who’s walking with you. Evaluate your alignments. Who are you bringing into the next season with you? Not everyone gets to enter in with you. Likewise, aligning with the right ministries & churches can move you where you need to be. Pray and ask the Lord to align you divinely in relationships – spiritual, personal and business. The minute you get the keys you need to use it/them. You don’t need to share the information, get collaboration or buy in from anyone. David did not consult his brothers or the army on the sling and stones. He knew what he needed to do and he did it. Besides they would probably tell him it was a stupid idea. But guess what? It was God’s key to his victory! Watch out for the double agents. Do you not know that the enemy has his agents? Your keys won’t be the same keys that unlocks someone else’s door and vice versa. If you speak it before you use it don’t be surprised if the enemy is there waiting for you before you enter in because you talk too much. Be quiet. The keys will be specific to you and only God can reveal this. (Matthew 16:19, 18:18). Can you imagine if the devil figured out Christ dying on the cross would bring salvation to the whole world before He actually went to the cross? Do you think the enemy would sit by? No. He would be fighting it with everything he had to make sure there was no crucifixion. So this plan had to be hidden. Jesus spoke in parables to the disciples about His crucifixion. The strategy was not revealed until it was all over. Likewise with you, remain hidden and follow through. God hides these things from even the elect! Until the kairos moment when you need to know, He reveals it. “They” will find out that you got to your promise land after you boarded the plane and end up there (please understand I am not telling you to move). There is always a Judas. You may want to read this as well. Fast. (Mark 9:29). Here is an article on Fasting. If God wakes you up at 4AM. Get out of your bed. Pray. Write what you hear. You’re in a war. Embrace the war. Don’t run away from it. Don’t ask God to remove it (because He won’t). Get the strategy and win the battle. There are some seasons when God will remove the enemy. This season isn’t one of them. There’s no going around, under or over… only through. You have to go through. If the Israelites had to fight, so will you. They fought to get out of Egypt, they fought to get in the promise land, after they got into the land they were still fighting to chase out the enemy. Then they fought some more to maintain it. And so it shall be with you. You want your blessing? Blessings don’t come without warfare and process! Armor on! (Ephesians 6:10-18) Here is a prayer. This was the month that God revealed himself to the Israelites as Jehovah Ropha “the God who heals” so this is a month for you to pray for your healing. Iyar is an acrostic and made up of the letters Aleph-Yud-Reish, the initial letters of the Hebrew words Ani YKVK Rophecha, “I HaShem am your Healer” (Exodus 15:26). Pray that God gives you the gift of discerning of spirits. This is not the same as discernment. Discerning of spirits will help you to know if something is from the flesh, the devil or God. When people speak to you it’s not what they are saying that should concern you but what/who is the source of what they are saying. Very important gift in this season. If you’ve read this and you’re thinking “huh?” It’s not for you. However, if you read this and it spoke to you, save this so you can reference it as you go through the month. The important points are in bold. You probably feel like you’ve been in a transition mode for a very long time. The truth is that most people transitioned into a transition into a transition. You are shifting. The key is to know when to shift. And your keys will tell you how to shift. It’s like driving a 18 wheeler. If you stay too long in one gear you will throw everything off. Remember God has people and places lined up for you and you need to be there when you need to be there. You must be able to accurately discern and SHIFT. Where you’re coming from to where you’re going is such a big step that God had to take you through stages and steps to get you where you need to be. You want to be sure that you are not like a dog chasing its tail (going around the same mountain…again) but that you are actually seeing progress. That you’ve grown in your gifts and maturity and that you are not bitter but better. Yes, watch out for that root of bitterness. Transition is a good thing because you are moving to a new level but it is during this time that you are most vulnerable because one wrong turn and you could be going around the mountain again. Watch this video. It’s a parable speaking to you about shifting and transitioning. We love you. God Bless You. See you on the other side! I keep reading this prophetic word at least twice a week. What a blessing! Praise God,am so blessed,actually i have written down everything in my book and I have started praying today and am expectant that all will come to pass according to God’s will for me this month of May.Thankyou so much God bless your ministry. Thank you, its for me and I am blessed by the revelations I received here concerning the month of May.